Find it hard to say no? Feel resentful that people take advantage of you? Don’t seem able to get what you want? Keep things bottled up, then find yourself “exploding”? Feel that people don’t listen or take you seriously? If you answered “yes” to any of the above, then this is the course for you. 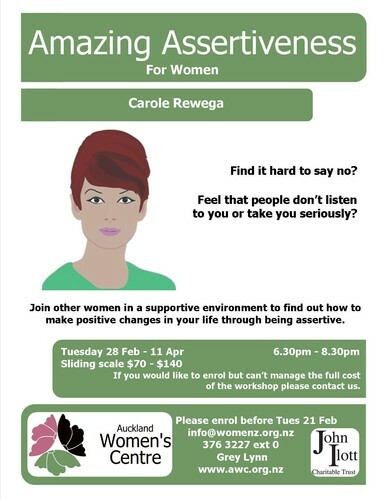 Join other women in a supportive environment to find out how to make positive changes in your life through being assertive. Fun, informative and really, really helpful! If you would like to enrol but can't manage the full cost of the workshop please contact us about a reduced rate. To enrol: Go to our website or Email - info@womenz.org.nz or call 09 376 3227 xtn 0.